Cristian Benteke scored twice against the club that sold him last Summer as two goals from the Crystal Palace forward were enough to end Liverpool's seven game unbeaten run and places them in danger of missing out on the Champion's League again. Liverpool began brightly with Phillippe Coutinho scoring a great free-kick in the 24th minute, but it was all downhill after that with Big Sam Allardyce's Palace team managing to subdue Liverpool for the rest of the match. Liverpool without Sadio Mané, Jordan Henderson and Adam Lallana in their ranks toiled in the Anfield sunshine and were undone by a former player so hastily discarded last Season. 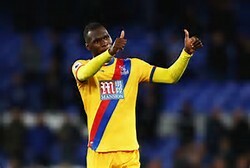 Benteke obviously had a point to prove to Klopp and exacted his revenge against his former club with ice-cold precision. So now the race for the top four suddenly looks a lot harder with Man City, Man Utd and even Arsenal able to overtake us if they win their two or three games in hand. Four games left for Liverpool to win and hope that others below them slip up.